We think you deserve the best Wichita has to offer. 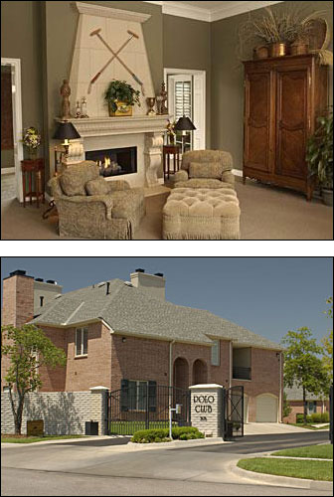 Polo Club Apartments offers you the finest housing available for lease in Wichita. Just 48 exclusive apartment homes in east Wichita, nestled in a quiet neighborhood setting, conveniently located near The Waterfront, Bradley Fair, and Wichita Country Club. Whether you plan on making Polo Club your home for years to come, are in need of a temporary home “in between homes,” or need an impeccably furnished executive apartment, Polo Club offers carefree living in a great location close to Wichita’s major employers, entertainment, restaurants and shopping. Designed and constructed by one of the area’s leading custom home builders, Polo Club offers a perfect blend of classic architecture and contemporary amenities. Our spacious one bedroom and two bedroom floor plans measure an incredible 1100 – 1315 square feet. Each apartment home features a direct access private garage, private balcony or patio, individual security system, full size washer and dryer, enormous walk-in closets, remote controlled gas fireplace, multi-line telephone system, double-crown molding, and plantation shutters. Amenities include gated entrance with intercom control, 24-hour fitness center, European clubhouse with lounge and catering kitchen, clubhouse storm shelter, landscaped terrace and pool area, and door-to-door trash pickup. Unique Concierge Services along with the best personal customer service you will find in the state of Kansas. From package delivery to pet sitting, we’re happy to make your life a little easier. Need to have your car detailed? Want discounts on dry cleaning, pedicures, or a storage unit? Need a ride to the airport? We’re happy to coordinate the details. Of course stamps, faxes, and e-mails are always available with a smile. We also, have fun and exciting monthly social gatherings, along with holiday events. Call, stop by for a personal tour, or visit our website --- we look forward to showing you Wichita’s finest housing available for lease. Once you see us, you will never want to leave us.